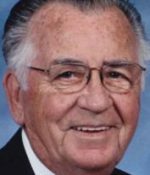 Remembering Bill Bay | Remembering Bill Bay | De Soto Obituary Search | Dietrich-Mothershead Funeral Home, Inc. Remembering Bill Bay | De Soto Obituary Search | Dietrich-Mothershead Funeral Home, Inc.
Bill Bay was born April 21, 1918 in St. Louis, MO. He was the son of Albert Monroe and Edith Amanda (nee Bryson) Bay. He died on February 4, 2016 at Mercy Hospital St. Louis, MO at the age of 97 years. He is survived by his wife, Ellen Lorraine (nee Sullenger) Bay. Bill and Lorraine were married on November 29, 1946 after Bill had returned from serving as a medic in the United States Army during several European campaigns of World War II. Bill and his brother Harlan then operated Bay’s Market which their father had opened in 1922; He is also survived by three children: Carol (Tom) Hatton, Dallas,TX, Bert (Peggy) Bay, Festus, MO, and Kay (Glen Coburn) Bay, Dallas, TX; one sister, Halene White, Leavenworth, KS; grandchildren, Bryson Bay, Lauren Bay, and Claire Coburn, step grandchild, Ty (Stacey) Hatton; step great-grandchildren, Trip and Sydney Hatton and a brother-in-law Darrell Sullenger, Tulsa, OK. He is preceded in death by his parents and brothers, Mel (May) Bay and Harlan (Dorothy) Bay; and brother-in-law, Marlowe White. 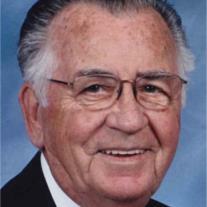 He was a member of St. Andrew’s United Methodist Church for 85 years, A 50 year member of De Soto Lodge #119 A.F. & A.M; Amvets Post #48; and VFW Post #1831. After his retirement Bill enjoyed traveling. He and Lorraine visited 49 states as well as Europe. He also enjoyed fishing, golf, and playing cards. Rev Darlene Payne will officiate the funeral service. As an expression of sympathy memorials may be made to the charity of the donors choice.